Time goes so fast, but some days seems to be unforgettable than others. This weekend had been a very special weekend for me and for those that were with me. It began with a beautiful day as you can see. It was a gift from above. We were going to visit our younger sister who has been very sick and we really missed her. Our cousin Celeste who lives in the city was also coming with us. We slept over on her place because we were going to take an early flight the day after. She and her husband made a very delicious dinner for us and we felt that we were in a first class hotel with a first class service. Anyway, the weather was also amazing the day of our flight. Our sister lives in a place called Vigrestad. 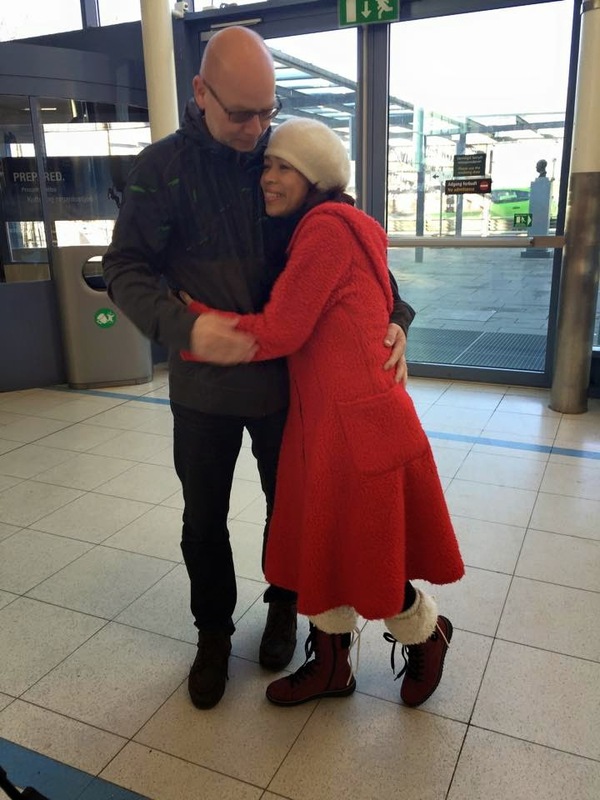 Since our sister Lida was very weak, we didn't expect her to fetch us at the airport. We thought that it was only Petter ( her love) who was going to be at the airport when we arrive. But she was there and even rented a big car so that there will be a place for all of us and that we can have a sightseeing while we were there. We were really very touched because she forced herself to be strong to be there to meet us. At the left, Minda a close friend of us, was also with us to visit Lida. So here we are: our cousin Celeste, my older sister Lourdes, younger sister Lida and me. We stopped by here to take some pictures. It was blowing so hard, but we had fun! My younger sister was not in the condition to cook, but she served homemade Philippines food which she ordered from another Filippina friend. In addition, she invited Lilli her closed friend there, whom I am longing to meet in person to dinner. We reallly had a wonderful time with her. She was a very kind and fine lady. We liked her very much. Petter, is an amazing man who loves our sister unconditionally.It shows in action and words. We are really thankful for his unconditional love. We were blessed with a beautiful sunset that evening. Not only that, Petter showed us a video of him and Lida where they were in the Philippines in 2013. Then we poured our hearts to each other. We cried, we laughed and we prayed. We reminisced the good times we had with each other and chose to believe that things will get better. Lida showed us her bridal gown and as you can see, is very beautiful. Time to go home the day after. We were also blessed with a wonderful weather. Petter drove us first to a shopping mall nearby to do some shopping while Lida went to her therapist. With this, I will not say goodbye to my dearest sister Lida. I say, until we meet again. Thanks ate Gaying for blogging. I am crying while reading your notes. I am deeply saddened seeing Ate Lida in a condition that nobody wants to be into. Yes, Mary Ann. Really tough for all of us. We can just rely om God. Joy, what a fantastic post and lovely photos. Thank God for unconditional love! It is so difficult to see a loved one in a weak state. Thanks Linda. Yes, it was tough to see my sister being so sick. Lovely photos! :) Lots of love. Stunning view, delicious looking feast, great friends. Live is amazing, huh? Boa tarde, é sempre muito bom o convívio familiar e demonstrativo de amor. What a special time with your family. I'm glad you were able to get together, I enjoyed the pictures! What a wonderful weekend you all had... Getting to be with family is always fun --but for you, getting to spend time with your sister is AWESOME... So sorry that she is so sick. She doesn't look sick at all in the photos... God Bless HER --and God Bless you and the family. I hope your sister gets stronger and healthier soon. Lovely shots of your reunion. I'm so sorry for your sister's illness. This was a beautiful trip in many ways. I love the picture of her wedding gown and the picture at the top of this post! a beautiful documentary of your visit with Lidia. Thank you for posting such a heartwarming time in photos and your words. I said a prayer for Lidia. I said a prayer that your dear sister will heal. I can feel the love you and family and friend have for each other. That wedding gown is beautiful, I must tell you.